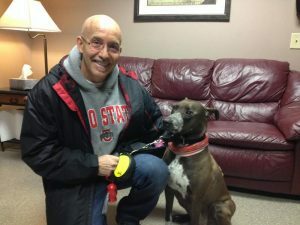 Radio station WVXU (91.7) in Cincinnati, Ohio recently covered the story of Pet Hero Bindi, a canine cancer survivor. During the live radio interview, Bindi and her dad Richard, share their story with the hope of helping other families whose pets are diagnosed with cancer. Bindi received life saving stereotactic radiosurgery (SRS) at PetCure Oncology at Care Center, part of the growing network of centers specializing in veterinary SRS across the country. You can listen to the interview at WVXU, New Pet Treatment Can Cure Cancer in Dogs and Cats. Richard Hussey’s dog Bindi has no sign of cancer after undergoing a new pet radiation therapy.